Thanks Dee for always taking the time to send a few words. It’s much appreciated. I think this is quite successful. It is about pattern and reasonable likeness. It is very believable! Thanks Gail. I appreciate hearing from you because I think we are both trying to move in the same direction. Impressive – planning, discipline, patience, talent, artistry – all come together in this. That is so nicely said. Thanks so much. This is a great picture! It looks so complicated to make it all look so believable! It’s complicated but in a kind of abstract way which makes it a challenge to paint. I loved doing this one. Bravo! That is an amazing analysis of a scene. Really spot on observation. Seeing the colored sail covers as more important than the boats in back was genius. I’m glad you found the explanation useful Nadia. Hello all the way to Germany. Wow Shari, this is amazing! Appreciate you breaking down the steps you took. I would have had no idea where to start. It’s great to hear from you Genine. I’m glad you liked hearing about the process. Shari, you did a very good job beyond the first row, if you had not mentioned it nobody, would have noticed it. the water réflexion is amazing. Shari, beautifull ! Did you use ink for the drawing? Can you guide me in buying a good ink pen? To use in watercolor painting…I saw some Waterman ink pens from $100.00 up…would you recommend these?…Is it better to use a pen with ink in tubes or a bottle to dip in? I was also told that if you don’t use your pen every day, the ink will dry and clog it? There is no ink in this one Louise. As for pens, my favourite one costs $12. I’m sure there are some great ones for $100 but I am perfectly happy with this one from Goulet Pens. It’s the Platinum Carbon Desk pen and it has a very nice fine nib on it. The problem with most other pens for me is that I find them too thick. And it is never clogged, even if I go for a few days without using it. Thanks a lot Shari, I will look into this.Love your work ! 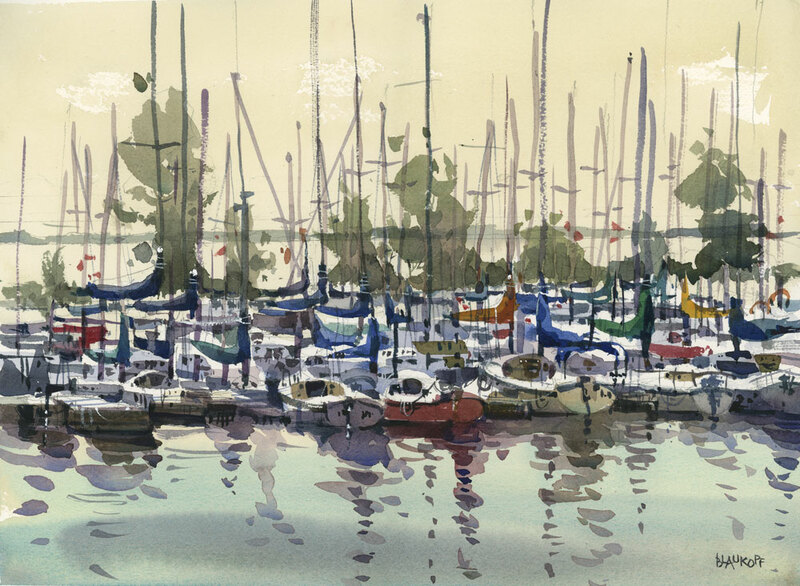 What I find so successful is that by defining only the first line of boats and merely suggesting those behind with shapes and color, you convey the message clearly, but by leaving the viewer’s brain to do the heavy lifting. I think that is what I always hope to achieve but don’t always succeed. Thanks for wording this so well. wow!!! you made sense of the confusion and i am still overwhelmed as to where i would begin if i were trying it myself. beautiful! Love this. And thankyou for the detailed instruction.